Nearly half the respondents (46%) say workflow is the most challenging area of contract management. 32 percent of respondents use a contract management solution, which is up 6 percent from 2016. 64 percent said the contract approval process was a problem in terms of causing deals to stall. 60 percent of survey respondents said they manage contracts via email. 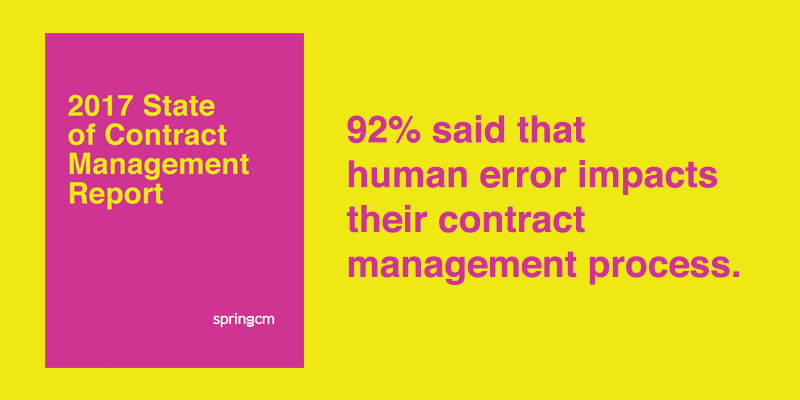 92 percent said that human error impacts their contract management process. While more organizations are making moves toward automation in their contract processes, many still struggle with manual, insecure contract practices. Automating workflow throughout the contract management process presents a significant opportunity for a more efficient sales cycle, and eliminates the challenges and risks associated with manual workflows. Businesses that successfully choose and implement contract management solutions are most likely to experience increased revenue and fewer contract-related errors. The 2017 study surveyed 1,409 users of contract management solutions, and respondents came from a wide range of industries and business departments. To read the full report, please visit https://www.springcm.com/research-report-2017-state-of-contract-management-lp.